Ember allows us to do a lot of things quite easily, which leads to the turbo mode of development. This most often happens after watching some cool screencast where they did this cool thing in about 5 minutes, and you start thinking wow I can write my whole app in one day using this technique/framework/library. But the cold truth is, you can’t. Now we need a login action handler and we’re done. Oh wait a minute, what if the username/password was incorrect? How do we display the error message? But this still isn’t good enough. 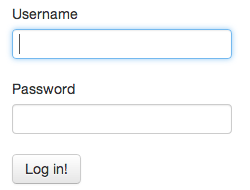 What if the login fails and the user tries to log in again? We need to hide the alert first, so that he knows the new request is being processed. We also want to prevent him from clicking the log in button while the request is being processed. Now we’re finally getting somewhere, our login form is already better than most sites, just by letting the user know that we’re processing the login. But we can take this a step further. Here’s a JSBin of the complete application (note that it has only 1ms timeout to make the isSlowConnection flag visible. Let’s stop here and think about why we did what we did. The main reason for the disabled button and slow connection indicator is that there is no other progress indicator for the user. If this was a regular Rails app, he could see the page being submitted and wait, but with background AJAX there is nothing.